A 5 to 6 hour course that provides the student with basic skills and the mindset required to confidently operate your handgun in a violent situation. Defensive Carry is geared toward the student with little or no experience operating a handgun; both open and concealed carry. The class starts with a lively classroom session followed by active drills on the range. After successful completion of this course, students will be prepared and more confident to defend themselves and their families. A 6 to 8 hour course that provides the student with refined skills required to confidently operate your handgun in a violent situation. Each class is tailored to the average skill level of the students. The class starts with an in-depth classroom session followed by tactical drills on the range. After successful completion of this course, students will be fully prepared to defend themselves and their families. A 3 hour course building on the skills and mindset learned in previous classes. LOW LIGHT will teach the student to confidently operate a handgun in a violent situation IN THE DARK. A truly unique opportunity to train with your handgun in a scenario that few other ranges and schools offer! This session is held completely on the range, starting with a lecture on hand-held flash light techniques, followed by memorable range session. 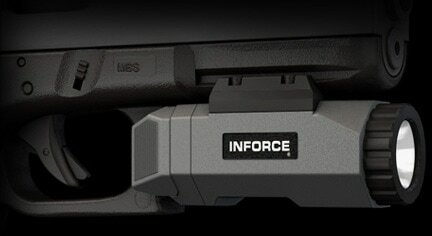 We will also train with pistol mounted lights. After successful completion of this course, students will be prepared and confident to defend themselves and their families in the DARK! A safe and serviceable handgun (pistol or revolvers). A quality holster, belt, and 2 magazine carriers mounted on belt. 3 to 5 magazines or speed loaders. NOTE: We encourage the use of your daily carry. If yours is low capacity (8 or less rounds), 5-8 mags are a GREAT idea so you are not missing out while constantly reloading. We have great prices on mags so you can stock up. Contact us in advance of class. Holsters should be outside the waistband until the student has demonstrated proficiency in the draw to carry inside the waistband. Appendix Carry is not permitted in Defensive Carry 1. Ask permission to carry appendix prior to registering for another class. 300 rounds of FMJ ammo minimum is required per class. No steel cases or hand loads. No incendiary or tracers. Ammo will be inspected prior to class.